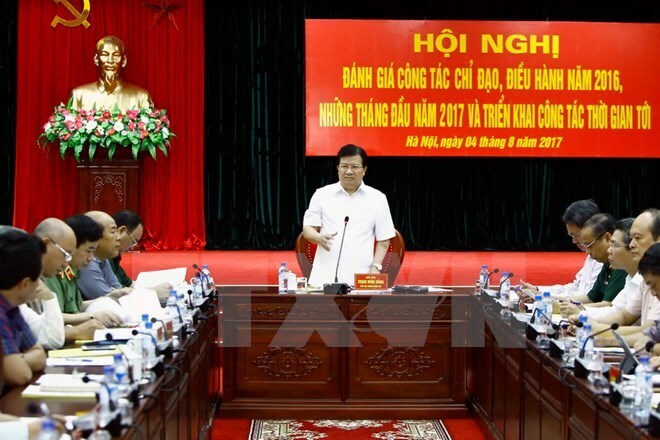 Hanoi (VNA) – Deputy Prime Minister Trinh Dinh Dung asked local authorities and people to fully grasp disaster and incident situation to stay ready for response while chairing a meeting of the National Committee on Incident, Disaster Response and Search and Rescue in Hanoi on August 4. In the near future, he urged the committee to instruct ministries, agencies and localities to continue revising and supplementing solutions to disaster risks such as flash flood, landslides and tsunami. At the same time, they should raise public awareness of disaster response and search and rescue, and increase supervision over the effort. According to him, search and rescue forces should enhance international cooperation, bilaterally and multilaterally to share meteorological and hydrological data, while improving forecasting capacity and learning from experience in incident and disaster prevention and search and rescue. He requested continuing to negotiate search and rescue areas at sea between Vietnam and regional countries in line with the International Convention on Maritime Search and Rescue 1979 (Convention SAR79) approved by the Prime Minister. Dung expressed his concern that among 499 disaster warnings last year, 119 were fake. Meanwhile, search and rescue equipment are insufficient, especially those used for underground works and firefighting. From early this year to July 30, 2017, there were 1,768 disasters, incidents and accidents nationwide, down 203 cases year-on-year. However, the death toll amounted to 511, up 42 while the missing people reached 145, up 45 from last year’s same period.